I’m Kirsty Major and I provide support and training for people who want to develop their English, particularly those who need to use English at work. I enjoy working with people and empowering them to grow in confidence and fluency when speaking or writing English. Seeing people using their new skills in their every day lives gives me a sense of job satisfaction! I am a language learner as well as a teacher. I am confident using my German skills now but I remember times when I wrote lengthy emails so that I didn’t have to pick up the telephone, or times when I sat quietly in a social gathering, wishing that I had the confidence to say more. I know how difficult it can be to feel confident about using another language, but my personal experience also shows that it is possible. I don’t use textbooks in my language and communication training sessions. My individual training sessions are designed to meet the customers’ specific needs. 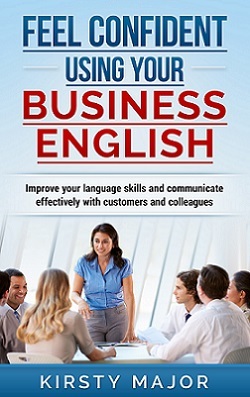 My courses, such as my business English course and my bite-sized grammar modules, do follow a structure, but they are my own materials that I have written so that people have clear information and many opportunities to practise English in ways that are relevant to their every-day business communication. I have two English teaching qualifications: a Teaching English as a Foreign Language (TEFL) certificate and a Diploma in Teaching Business English, both passed with distinction. 1. My favourite animal is the dog and my favourite dog breed is the golden retriever. 2. I’m a night owl! 3. I’ve always been interested in languages. I learned French and German at school but didn’t continue with the French. I learned Hindi for a couple of years and I am now also learning Turkish. 4. Things that I never allow to run out in the kitchen are coffee, chocolate and chilli flakes! 5.Even as a child, I wanted to be a teacher. Originally I gave up on the idea because I didn’t want to work in a school but after working in other roles such as communications, I came back to the teaching when I realised that I could train adults online. If you want to find out more about what I do and what my customers have to say about working with me, you can have a look around the site. You can also have a look at my free resources for learners of English. Then, if you have any questions or you want to talk about working with me, you can send me a message using my contact form. You can also visit my Facebook page or follow me on Twitter. In terms of business networks, you can also find me on Xing and Linkedin.